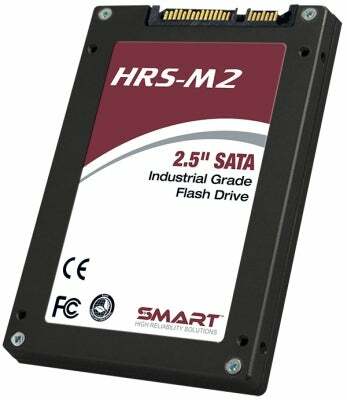 HRS-M2 ATA solid state drives (SSDs) combine high performance, superior reliability and data security into a single ruggedised design, making it the ideal storage solution for many demanding defence, industrial automation, transportation, medical and telecommunication applications. Utilising a SATA 6GB interface, HRS-M2 SSDs deliver 525MB/s sequential read and 500MB/s sequential write speeds, up to 70,000 random read IOPS and up to 50,000 random write IOPS. Capacities of 240GB, 480GB, 960GB, and 1920GB are available using cost-effective multi-level cell (MLC) NAND Flash. SMART’s HRS-M2 SSDs are designed to meet the needs of cost-sensitive applications where temperature tolerances are as important as high performance and reliability. A robust set of diagnostic tools is provided through SSD-specific SMART attributes which can be used to monitor the health of the drive. The M2 employs pFail back up technology in case of accidental power failure. HRS-M2 SSDs automatically protect all data written with AES 256-bit encryption. Also included is the security erase feature per the ATA-8 specification whereby the encryption key will be deleted in less than one second. When the SSD has too many bad blocks, the M2 goes into write termination mode, whereby no more data can be written.